Found this red-belly this morning working a dead snag on our property line. I’m not sure how long he/she has been at it, but there’s the makings of a nice nest hole there – it amazes me how perfectly round it is! I can see a place or two on the snag where a hole was started and then abandoned in favor if the one directly in front of the bird. The current issue of I and the Bird is up at Bootstrap Analysis. Check it out! 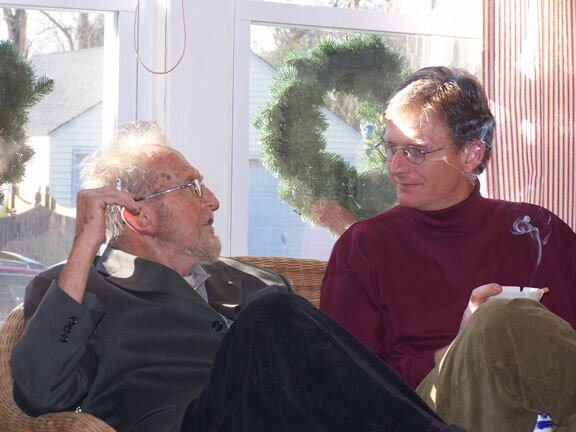 My dad was a talker, a storyteller, a lecturer. As children, my brothers and I were raised with the philosophy that children were to be seen and not heard; especially at the dinner table. My oldest brother tells the story of an hours long drive to Canada for a fishing trip with my dad a few years ago, when my dad talked nonstop for the whole trip. He talked so much that he was hoarse when they arrived. Anyone who knew my dad would know this to be entirely likely. As a result, I’m a very quiet person. Not shy, just more prone to sit back and listen. I spent lots of time wishing that my dad would just be quiet and stop talking for a little while. When I grew up and was married, I got to the point where I could joke with my dad about his talkativeness. He was a strict, very old-fashioned kind of person. He would allow this *freshness* from his only daughter and laugh when I rolled my eyes at him for saying, “In other words…” for the umpteenth time in a story that I had already heard a bazillion times. His talking was as much a defining feature as was the cigarette dangling from his fingers and the cup of coffee he never seemed to be without. This picture was taken on Christmas morning in 2003 and we found out about 2 months later that he was sick and dying from cancer. One of the hardest things about the months that followed wasn’t coming to terms with the fact that my dad would die soon, but facing the day-to-day with him. Watching him lose all the things that he loved so much, little by little. He moved out of his home and gave up his dog to the SPCA because he needed my brothers and I to care him. He (finally) gave up smoking because he no longer enjoyed it. Coffee didn’t hold the same pleasure anymore without a cigarette to accompany it. He lost his appetite. Every favorite meal I fixed for him tasted like *cardboard*. He didn’t have the energy to sit at the computer or to make endless charts of his monthly financial budget. He stopped talking and telling stories. Never did I think that I would miss that, but I did and I do. I wish that I had been paying more attention. I wonder that I didn’t maybe miss something important with all my eye-rolling. First grade teacher’s name: Mrs. LaForge. I was scared of her. Last word you said: Dora! Last thing you laughed at: Susan’s answers to this silly quiz. Last time you cried: Hmm, can’t remember. What color socks are you wearing? White. Current hair: Curly blonde mess. Current outfit: Jeans, t-shirt, cardigan sweater. Current annoyance: My husband watching wrestling on the tv in the next room. Current smell: White Sage & Citrus candle. Current longing: More free time without guilt for what I *should* be doing. Current desktop picture: Bunny photo sent by a friend from PB. Current worry: Will it ever get warm? Current hate: n/a Try not to be hateful. Current favorite article of clothing: My old white sneakers. Line from the last thing you wrote to someone: Huh? Don’t remember. I am happiest when: I have the day off. I feel lonely when: Never lonely. If you could live anywhere in the world, where would it be? Right here; just wish everyone else weren’t here too. Famous person you have met: Vice-President Gore drove past my house once. Bruce Springsteen lives in the next town over, does that count? Do you have any regrets? Sure, but not many and they’re not important ones. Favorite coffee: Dunkin Donuts extra, extra light with cream. Favorite smell: Behind my bunnies’ ears. What makes you mad? Moody, self-centered people. Favorite way to waste time: Blogging. What is your best quality? Adaptability; looking innocent. Are currently in love/lust? Well, I’ve been married for 13 years. What would you guess? What’s the craziest thing you have ever done? Not too prone to craziness. Do you find it hard to trust people? No. Last thing you bought yourself: Lunch. Favorite time of day: Late at night when everyone else is asleep. Any secret crushes? Yea, and he knows it too. Do you wear a watch? Usually. Favorite stores: Barnes and Noble. How big is your closet? Tiny. Ever spend more then $200 in a store? Yes. Do your friends know everything about you? No, they might be surprised. What do they tend to be like? Opinionated, smart, good people with big hearts. Can you count on them? I hope so. Can they count on you? I hope so. Movie you saw on the big screen: Haven’t been to the movies in years. Think it was Winged Migration. Hated it. Show you watched on tv: Don’t like tv. It’s good to fall asleep to, though. Song you heard: Come a Little Closer Baby by Billy Currington. Thing you had to drink: Sam Adam’s Spring Ale. Yum! Thing you ate: Tuna and American on wheat for lunch. Time you showered: This morning. Time you smiled: A few minutes ago. Time you laughed: A few minutes ago. Person you hugged: Not the huggy type. Person you talked to online: Hmm, don’t remember. Maybe Michelle. Person you talked to on the phone: Hate phones too. My DH on the way to the vet. Sleep with stuffed animals? No. Have a dream that keeps coming back? Yes. Something about going over a bridge and not wanting to. Play an instrument? Sort of: piano, clarinet. Trying to learn the tinwhistle. Read the newspaper? Yes, online. Consider yourself tolerant? For the most part. Like the taste of alchohol? No. Go to church? Not often enough. Have any secrets? A couple. Have any pets? Bwaa, haa ha. Have any piercings? Just my ears. Have any tattoos? No way. My husband has plenty. Wish on stars? When I need to. Believe in the tooth fairy? No. Sing in the shower? No. Wanna go for a ride?!? That I was home in the middle of the day, on a work day, should have been his first hint that I was up to no good. Despite his age, Buddy is still a sucker for a car ride. 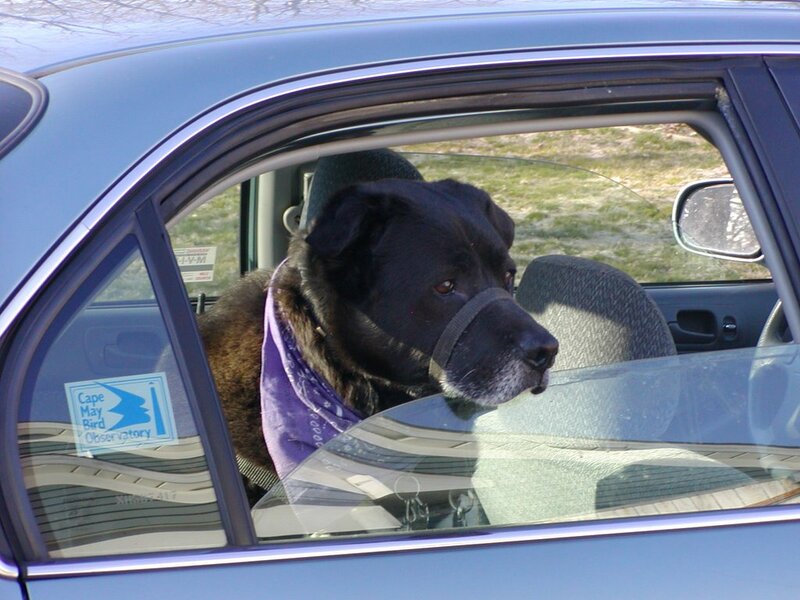 He always seems to think we’re going to the beach until we pull into the driveway of the vet’s office. Then the whining and dirty looks start. Buddy makes me proud with the way that he behaves at the vet. He politely steps onto the scale in the waiting room and sits down to be weighed. He doesn’t blush when the receptionist announces his weight to the whole room (94.1 lbs. !!). He doesn’t pull on the leash like some wild thing. He’s too scared to misbehave. I can tell that he likes our new vet better than the place we’ve gone to for most of his life. I don’t have to drag and coax him into the door with my silly voice. He doesn’t show his teeth to this vet when she shines the light in his eyes the way he did with our old vet. He still tries to crawl under me to hide, but even that is an improvement. So, we came home with yet another rinse for his ears and the same old meds to try and get rid of this ear infection. It seems to go away for a while and then comes back. Hopefully, this time it will work. I know that Buddy isn’t looking forward to my cleaning his ears and then squirting the goopy meds in twice a day. He goes along with it well enough. So long as I sing to him, while I do it. The things we do. Despite the rain off and on all day I needed to be outside doing something. So I spent a few hours cleaning out the old nestboxes and searching in the basement for the new hangers I bought last fall. All of the old boxes were full of sticks from the house wrens. I found a cranky looking little black spider in the bottom of one of the boxes and felt bad for disturbing his slumber. 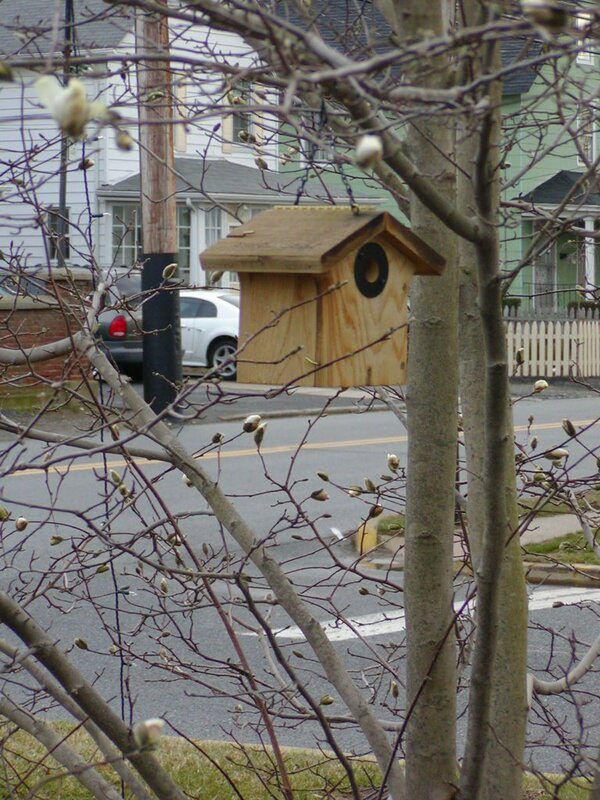 I spread the boxes out a bit more and put one in the magnolia at the fr ont of the house. Not sure if I’ll get anyone there, but it’s worth trying, I suppose. 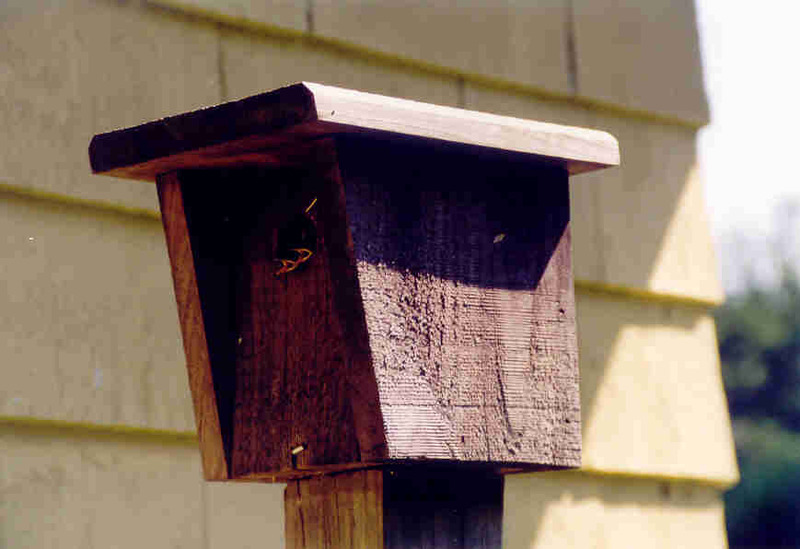 I was tempted to buy a house with a larger hole for carolina wrens, but was afraid that would only encourage the house sparrows to nest. A few times I’ve had chickadees (think that’s them peeping out of the box at right). I like to ref er to the book at left for help in deciding where to place a nest box and other questions about how to be a good landlord for birds nesting on your property. It’s a good book for beginners and includes tips on attracting and feeding birds, good plants for birds and butterflies and some info about hummingbirds. It was one of the first I bought about birds and has been a good general reference through the years. 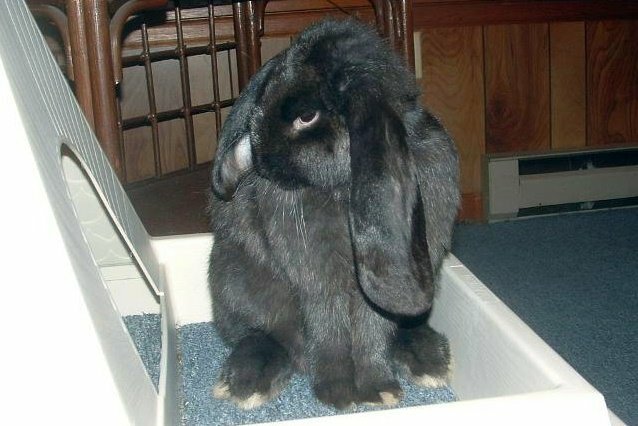 Tinkerbell is a French Lop and belongs to my friend Michelle from PetBunny. The Frenchie is known for its long ears (but not so long as an English Lop) and its large size (up to about 15 pounds, right Michelle?) Tink is still a young-bun in the picture here, but will bulk up and grow into those ears soon! 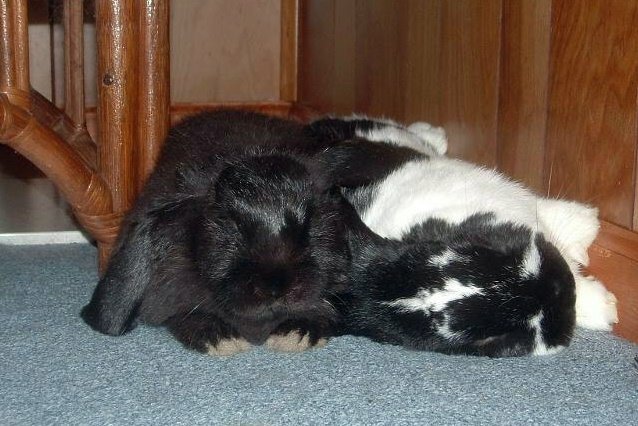 Tink is the beloved com panion of one of Michelle’s other bunnies, Chopper, seen here flopped on his side in a moment of bunny-bliss beside Tink. I have read that French Lops are very affectionate and playful rabbits. Much like a Flemmie, it seems that Frenchies are a breed that people fall in love with once they’ve had the company of one. At least I know that’s the case with Michelle. Thank you, Michelle, for letting me post some of your photos here! 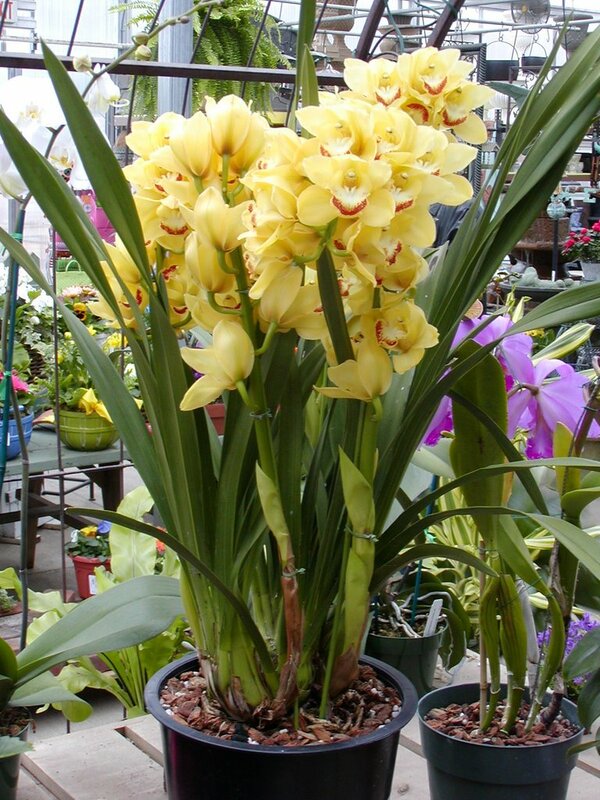 Is this cymbidium orchid drop-dead gorgeous, or what? I don’t know anything about orchids, but I wanted this one! I came home with a much smaller, but almost as pretty phalaenopsis orchid that is supposed to be a good *beginner’s* orchid. We’ll see. I’m not very good at keeping flowering houseplants alive. The saleslady says that most people kill orchids with too much kindness and that I should only need to water it well once a week and provide dappled sunlight. Uh-huh. Wish me luck. 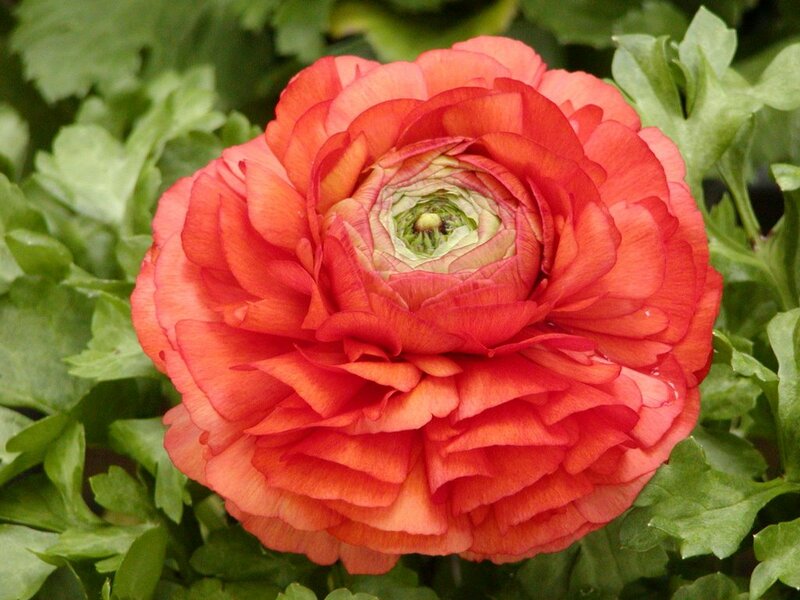 A visit to the local garden center always cheers me. Especially at this time of year when all of the cute bunny items seem to be everywhere. For the most part I restrain myself from buying any of it. This display of planters, birdhouses, and Easter nick-nacks was just so cheerful and fun. 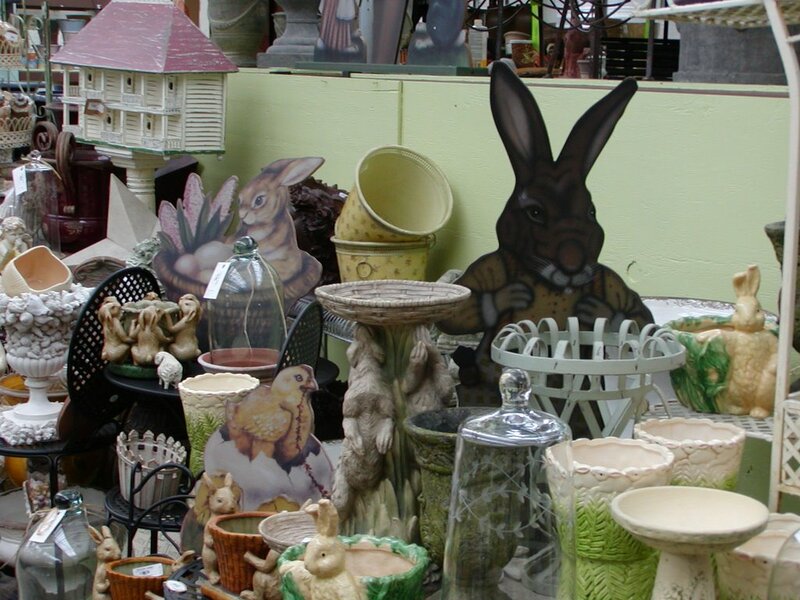 I love the giant Peter Rabbit peeking out from the back! Not your ordinary garden center, this place has just about everything rela ted to gardening, plus garden-themed housewares and a wonderful gourmet market. I miss the days before it became so popular, when it wasn’t much more than a farmer’s market run out of a large garage, with the owners selling locally grown vegetables and flowers. Their peach and apple orchard used to back up to our yard. Now we have soccer fields and a running track and they buy their produce elsewhere. They still grow raspberries and blackberries on part of the property and corn nearby. On summer mornings I will sometimes see old Mr. S. going by our house on his red tractor and he often stops to chat with me about the red-tailed hawks that nest in a huge pine tree on the edge of his fields. I’d guess he must be pretty amazed with how his family business has grown through the years. 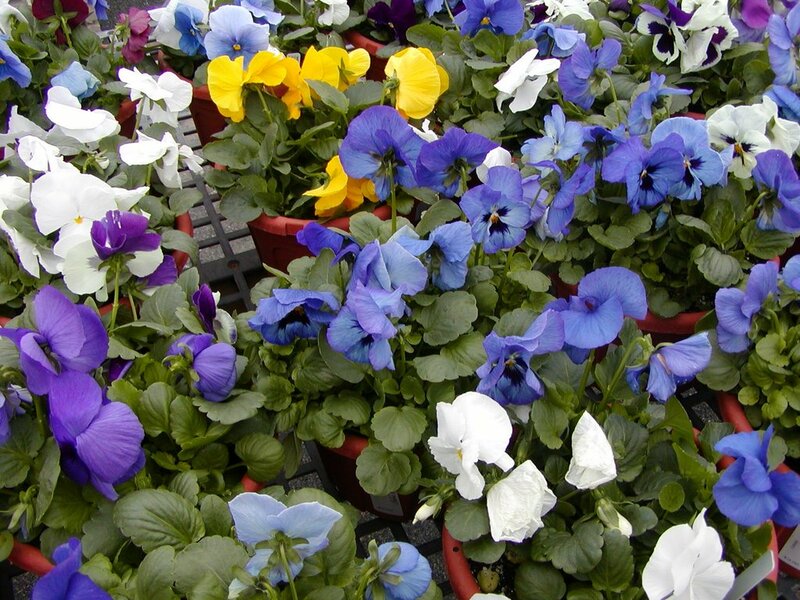 The color in the greenhouses is so breathtaking on such a gray early-spring day that I wanted to bring it all home with me, but I behaved myself and only bought a few pots of purple pansies for the front steps and the little yellow orchid. And two bunches of delicious pink muscatel grapes and my favorite red pears. Yum! How many months till strawberries come in? On each birding trip to the Adirondacks we make our way to Whiteface Mountain. We try to visit on a clear day so that the views will be good. 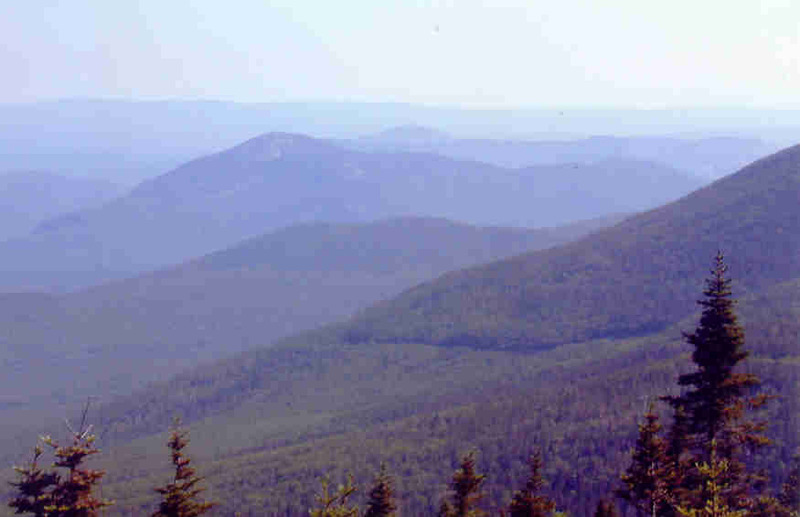 From the summit of Whiteface you can see all the way to Vermont, I think! We don’t do very much birding on this part of the trip. On the drive up the mou ntain we’ll stop periodically to listen for Bicknell’s Thrush and look for alpine butterflies and plants. Mostly we enjoy the spectacular views along the way. 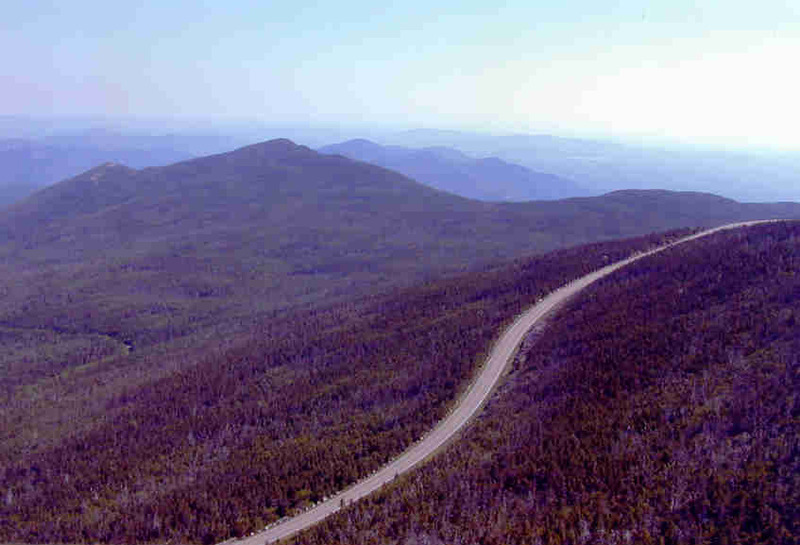 The Veteran’s Memorial Highway was a depression-era public works project and is more than five miles long. 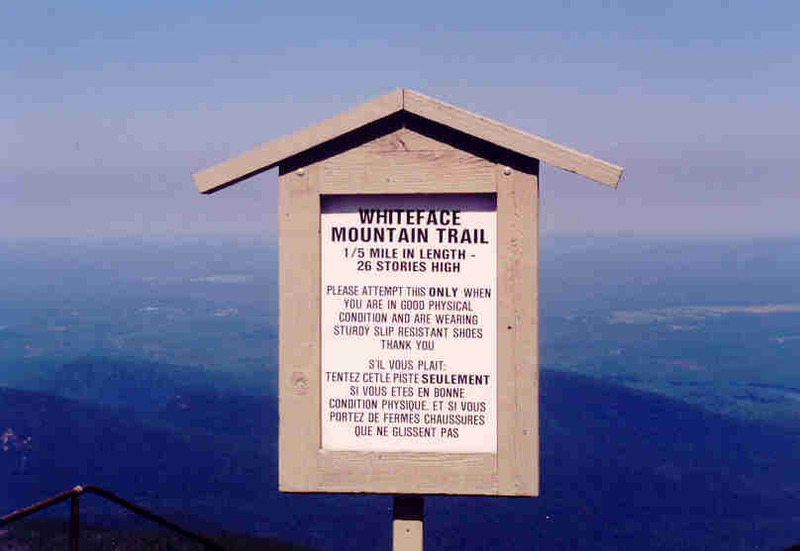 Whiteface is unique in that is has a *developed* summit – a visitor’s center known as Whiteface Castle. The castle was built from granite excavated during the construction of the highway. There is an elevator t o the summit (at the end of a very long and scary tunnel into the mountain) or you can choose to take the footpath. This sign is at the trailhead and warns not to attempt the footpath unless you are physically fit. The hike ascends more than 25 stories over a fifth of a mile. Not easy, but better than the claustrophobic tunnel to the elevator. I take lots of breaks on the way up to look at alpine plants and the lichen-covered rocks, and to catch my breath! 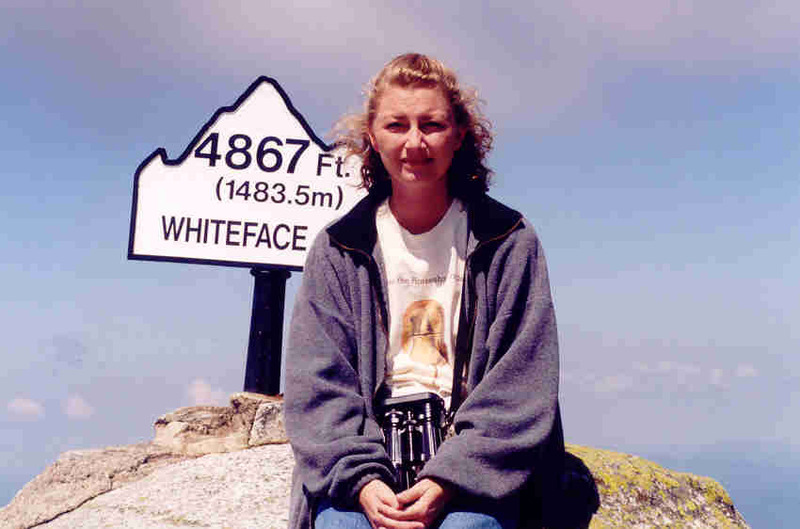 Here I am at 4867 ft. looking flushed and glad for a place to sit down and enjoy the view. Once we’re at the peak of the mountain, we generally take a break for lunch and take lots of photos. One year I took nearly a whole roll of film with pics of nothing but rocks. 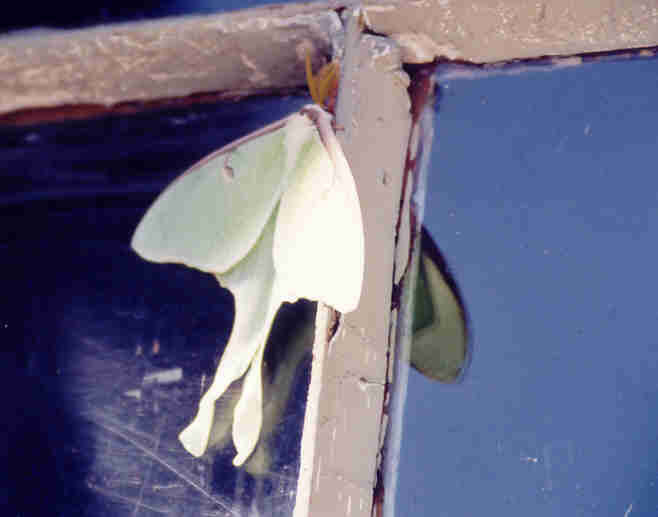 There is always an interesting assortment of tourists milling around and one year the building that houses the elevator at the summit had a few Luna moths clinging to the windows! I’ve only ever seen Luna moths in the Adirondacks, so it is a treat to find them. On one visit the toll building at the bottom of the mountain was covered with them and other interesting large moths. We watched little chickadees coming in from the wood’s edge and flying off with the moths in their bills.